This coffee cake is light and fluffy. I decreased the sugar from the original recipe by half a cup and still think it is sweet enough. You can use cubed fresh pears in this recipe instead of blueberries. You can also use pecans instead of walnuts in the topping. This would be nice for brunch along side a savory dish. Blend first four ingredients in food processor until nuts are coarsely chopped. Add butter; using pulse to blend until coarse crumbs form. 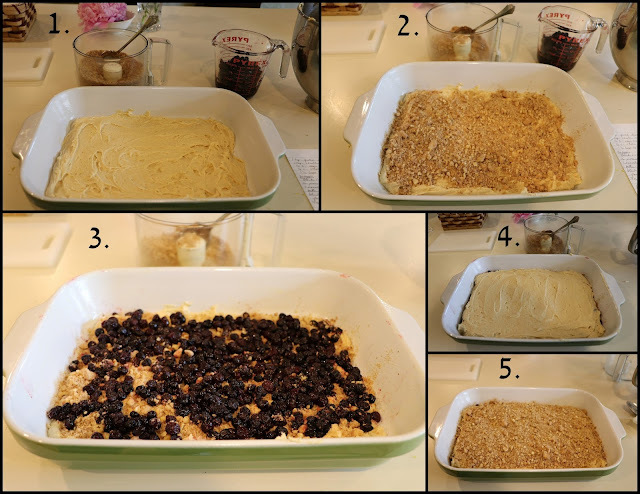 Prepare 13x9x2 baking pan by greasing and dusting with flour, shaking off excess. Sift flour, baking powder, salt, and soda in medium bowl. Using electric mixer beat butter in large bowl till fluffy. Gradually add both sugars and beat until blended. Beat in eggs, one at a time incorporating after each egg. Blend sour cream and milk in small bowl. Beat in this mixture alternating with dry ingredients in 3 additions each. Spread half of the cake batter into prepared pan. Sprinkle half the topping over the batter. Cover this mixture with the blueberries evenly. Spread remaining batter over this layer. Sprinkle with the other half of the topping. Bake for approximately 50 minutes or until tester comes out clean. Thank you, Ellen, for all the extra effort you went to with the photos. I love seeing all the pictures. They are so helpful in understanding your recipe! Yum - I would like a piece right now with my morning coffee!!!! That looks SO good. Love that there is lemon zest in this. Ellen, this looks perfect! And I love that you reduced the sugar (something I do a lot). Wish I had some blueberries on hand this morning. Delicious! Can I substitute frozen blueberries? Yes, Barbara, I used frozen but I let them thaw in a colander and emptied the colander onto paper towels to get the excess liquid off the thawed blueberries. Thank you so much for this delicious recipe. I will love it! Oh my goodness Ellen, first chance I get I am making this. Thank you for another delicious recipe.